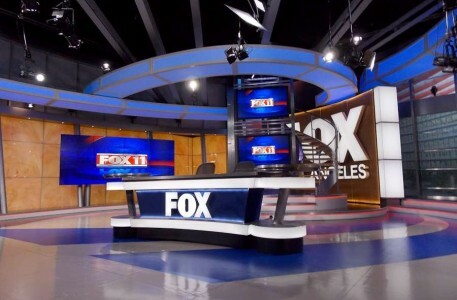 KTTV, Fox’s O&O in Los Angeles, added an additional anchor desk and video wall to existing studio. The new area, which is located right next to the larger set it installed in 2013, features a boomerang-shaped anchor desk with thick glass top and internally lit base. Behind this is a 9×3 curved video wall that is used to showcase a variety of graphics. The new update, including the custom desk design, is from Broadcast Design International. 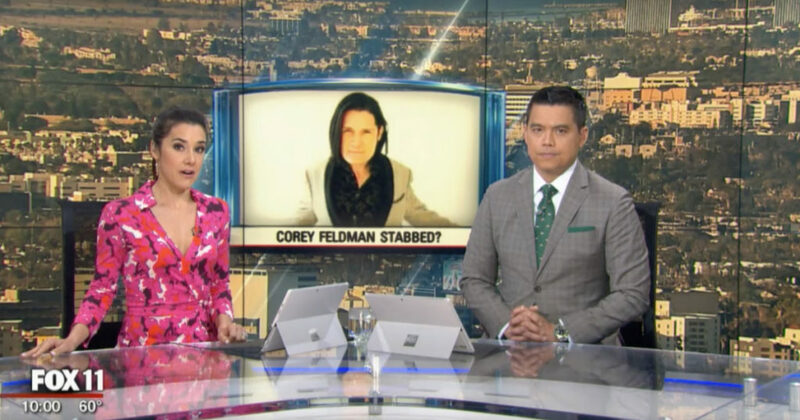 The new video wall allows the station to feed a cityscape background behind the anchors, which is overlaid with semitransparent angled accents and, optionally, blue floating “frames” that include topical graphics. 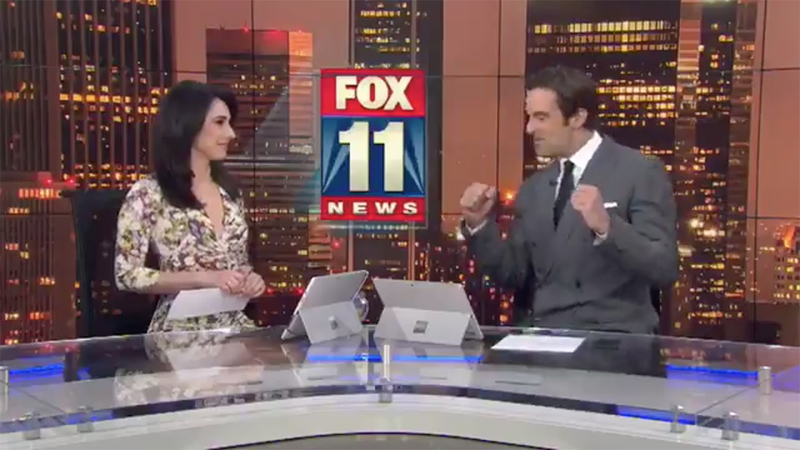 Camera center also frequently features the station’s stack “Fox 11” logo, while topical photographic backgrounds also pop up frequently. 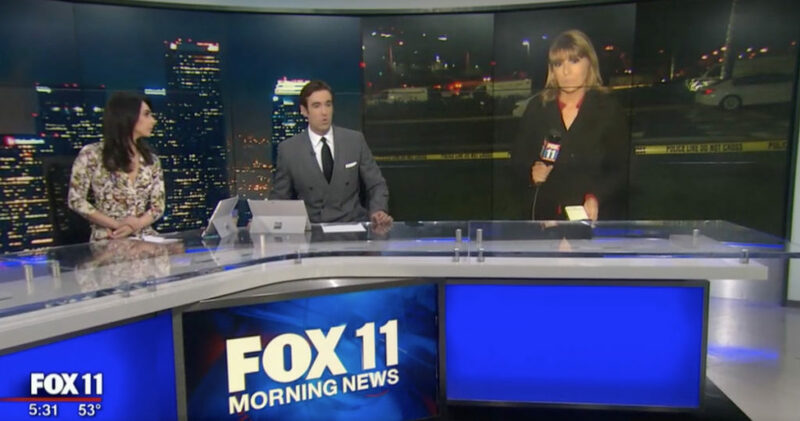 For select live shots, a wide toss shot is used with the reporter shown in another frame on one side of the video wall. Other tosses are done by simply using a larger, rectangular image of the reporter. The station also uses the new video wall for larger-scale storytelling setups, including rundown style segments that incorporate wider jib shots. 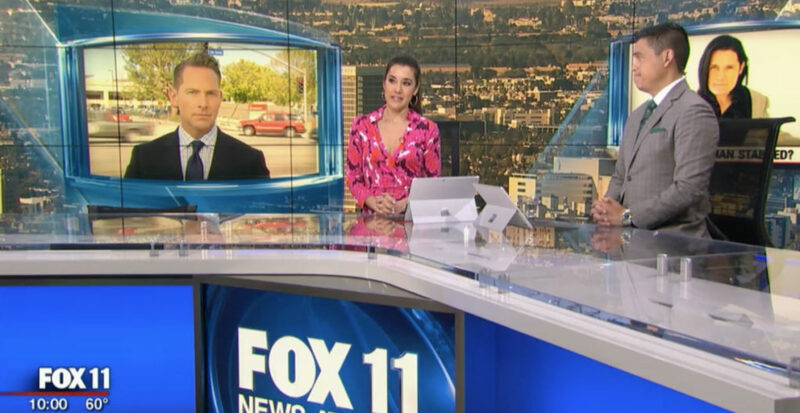 The older set, meanwhile, is still used for a variety of segments, especially during the station’s long morning “Good Day LA” and midday news blocks.